The National Kidney Foundation has a long history of opposing all cuts to patient care, particularly relating to dialysis. Proposition 8, a ballot initiative put forth in California by the Service Employees International Union—United Healthcare Workers West (SEIU-UHW), could be disastrous for dialysis patients, causing clinics in low income and rural areas to shut down. Help us spread the word. Share these articles and social media posts with your friends and family in CA to vote NO on Prop 8 on November 6. What is Prop 8 and how much can it harm dialysis patients? Get the facts. #Prop 8 has had a few different names, but none of them convey how damaging it could be for dialysis patients. So, the National Kidney Foundation @NKF thought of some more fitting names. This November 6th, vote #NoProp8. #Prop 8 has had a few different names, but none of them convey how damaging it could be for dialysis patients. So, the National Kidney Foundation thought of some more fitting names. This November 6th, vote #NoProp8. If #Prop8 passes, insurance companies could profit from funds that would otherwise help patients. Prop 8 has been called many things, but the National Kidney Foundation thinks it should be called this. This November 6th, remember to vote #NoProp8. #Prop 8 has had a few different names, but none of them convey how damaging it could be for dialysis patients. So, the @NationalKidneyFoudnation thought of some more fitting names. This November 6th, vote #NoProp8. If #Prop8 passes, the loss of funds could mean understaffed #dialysis clinics and insufficient care. That’s why the @NationalKidneyFoundation created a more accurate name for this dangerous proposition. This November 6th, remember to vote #NoProp8. The name #Prop 8 doesn’t tell you what might happen if it passes, but this proposition could cause #dialysis clinics across California to close. This is what it should be called. This November 6th, remember to vote #NoProp8. If #Prop8 passes, insurance companies could profit from funds that would otherwise help patients. 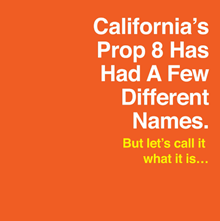 Prop 8 has been called many things, but the @NationalKidneyFoundation thinks it should be called this. This November 6th, remember to vote #NoProp8. 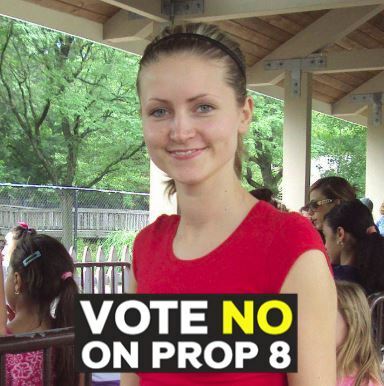 Go to Facebook Profile Frames and look up "National Kidney Foundation" to find the “Vote NO on Prop 8” frame.